In the era of computer-based gaming, having the right mouse is crucial. With so many brands and so many types, buying a mouse has become a tough decision to make. There are many in the market which aren’t worth the money they ask for, but Gigabit has come up with one that has features of a gaming mouse yet is affordable. The GM-Force M7 Thor is a big mouse with a dull, non-slick, anti-abrasion body. The upper side is housed with two buttons between which is the scroll wheel. Below the buttons are the resolution switch, which enables the user to vary the resolution from 3 DPI to 6,000 DPI, and three blue LEDs that indicate the current sensitivity level. The lower back contains the shiny “Thor” logo surrounded by lightning. From the upper side comes a long plastic cable with gold-plated USB plug at the end. The long cable is beneficial for boxes lying on the ground. The mouse is ergonomically designed with a symmetrical body and flat rubberized niches at both sides to provide better grip for the users, making it the best choice for long-term usage. The efficient and idealized shape provides the gamer comfort, stability, and precise movement during frenzied use. The right side of the mouse contains the two familiar side buttons, making it an ideal product for right-handed users. On the back side of the mouse is the laser sensor and three rubber feet for smooth and fast gliding. The GM-Force M7 Thor consists of five programmable buttons, which can be customized using intuitive software application. Apart from customizing button settings, gamers can vary button sensitivities as well as simulate keyboard keypress according to the user’s needs. The Thor is a simple mouse powered by the 6,000 DPI advanced gaming laser sensor that enables lightning fast 12,000 FPS image processing, which is four times the sensor of the standard mouse. This advanced laser engine provides reliable and optimum performance. The 3-stage DPI adjustment switch, which enables 800/1600/5600 DPI settings, provide quick DPI variation. The hardware based sensitivity is up to 5600 DPI and the software based sensitivity is up to 6000 DPI. 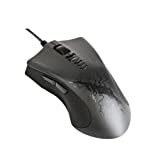 The mouse is highly sensitive for the games that require dynamic action like Battlefield 3 and Call of Duty. The user can set three distinct sensitivity values with higher values for intense action moments and a lower value when a player is sniping. The resolution switch is very precise and will never let the gamer down. Although the GM-Force M7 Thor is long, it is light as compared to its size and mobile under the gamer’s hand. Moreover, the quality of the mouse remains intact even after long-term usage. The rubber niches provide comfort and do not start to wear out after some while. Thus, the GM-Force M7 Thor is highly recommended for people looking for a gaming mouse at a reasonable price range.